select Add then confirm the selection by clicking ok.
clicking the button Submit to a Secure Order Form. If we cannot process or accept your Order after payment is received we will contact you as appropriate. we designed this method specially for beginners and customers not really sure which product they should use for different objectives and target they want to reach, also our experienced customers could use this way to find more items verities very easily by locating the category or product type they looking for. Simply select your goal either bulk up, get ripped etc... Then select the product type you after if it is a pre work-out or intra work-out etc... Then finally this will limit your search choices so you can choose your target item from your preferred brand at the last step. Search by keyword or product name in the search box at the top right hand corner. Search by brand in the drop down box on the top. Browse through numerous special categories on the side box. When you find the product you are looking for, choose the quantity you after, size, flavour and add to your shopping cart. Do not forget to add your promotion code “If you have one “in the space provided for code. When you have finished shopping and are ready to checkout, click the Checkout button on the shopping cart page. To finalise the sale you need to be a registered user, so please log in using your email address and password to finalise checkout. If not yet a registered customer, please fill out your details in the 'Create an Account' section. Fill in all of the required information on the customer details page. If you have forgotten to fill in a required field, we will alert you so you can go back and try again. Complete the required fields with the requested information and continue to checkout again. Review your order before final check out so make sure you are paying for what you really want. We currently accepts PayPal; Postal Money Order; (American Express, MasterCard and Visa credit cards) are only processed via Paypal. Payment processing will only begin when we have received all the required information. Payment processing for orders placed on a weekend or a Public holiday will begin on the next business day. We process credit card and PayPal payments after you click the "Submit to a Secure Order Form" button. Money Order is easy! Just make a note of the total amount of your order including shipping, go to the Post Office, purchase a money order for that amount, write your name and order number on the reverse and post it to 1 Deal a Day Pty Ltd, PO BOX. We will ship your product when we receive your letter. We reserve the right to cancel the transaction. We also recommend that you print off your order page and your payment page. 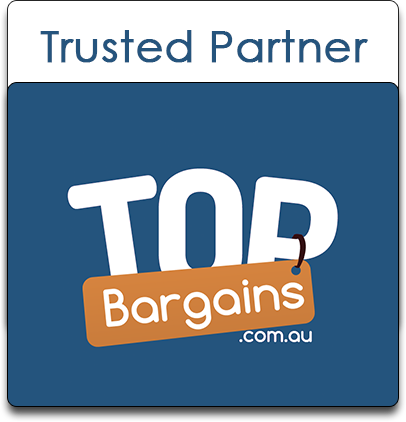 Your purchase price is GST inclusive for all purchases and services. We will supply to you the Products specified on your Order Confirmation, subject to these Terms and Conditions. We ask you to send a copy of your order invoice along with the Cheque or money order so we can identify your order for quick processing. It may take up to 4 working days from the date your payment is received and validated until your product is delivered to you, unless specified otherwise within listings. Although every effort is made to expedite your Order, shipping times may change due to changes in supply or circumstances beyond our control. We do not guarantee that we can affect delivery within 4 business days, however, we will make every effort to deliver your Products to you within this time frame. We will deliver your Products to the address you give us on your Order Request. Please be available to take delivery of your Products. If you can't be at home our wonderful carrier (Australia Post eParcel) will leave a card so you can collect your Product from the local Post Office. Sometimes delivery is through our courier service and if no-one is available to take delivery, they will leave a card asking you to telephone them to arrange a suitable time and date for delivery. Should you change your mind about the product, make an incorrect choice, or fail to verify and accurately provide information when placing an Order, there are no refunds or replacements. Damaged Or Dead On Arrival Products - "DOA"
If the Product is deemed by Customer Services NOT to be DOA, 1 Deal a Day, at its absolute discretion may withdraw the offer to replace the Product. When a Product is replaced, the returned DOA Product becomes our property and, your replacement Product becomes your property. We reserve the right to confirm the condition of any returned alleged DOA Product. If the condition of the Product was misrepresented to us by the customer, we will impose a $35 administration and handling fee. If you find a defect arises after delivery and a valid claim is received by Customer Service within 7 days of delivery, we will exchange the Product unless a manufacturer's warranty applies. Should it not be possible for we to provide a replacement, we will refund you the purchase price of the Product. Should you contact us outside the 7 day period customer service management will consider each claim on a case by case basis on its merits. Where we agree to replace the Product, you must first return the defective Product to us. For assistance with warranty and returns please email us before you return anything. For all faulty items with a Return to Base warranty, buyers must contact us by e-mail. We will send an RMA Number to the buyer to enclose and kindly send the form back to us together with the faulty item. Please Note: For all returned non-faulty items (identified by our technical department), the buyer is responsible for shipping and handling fee for re-sending the item back to buyer**We have NO responsibility on the shipping and handling fee on any returned items. If buyer sends back the item by C.O.D. service, item will NOT be accepted. For both replacement Products and potential refunds a Return Authorisation Number (RAN) is required. Where Customer Service has conditionally determined that a Product is DOA, Customer Service will issue you with a RAN. Products can not be returned without a RAN. The Product should be returned to 1 Deal a Day within 7 calendar days of the issuance of the RAN. DOA Products must be returned whenever we agree to replace the Product. Where you received a DOA Product by Australia Post eParcel, Customer Service will email you a docket containing a RAN which you must affix to the Product. Refunds will be arranged through the same credit card that you used to make the initial payment. For items advertised and sold with manufacturer's warranty, we would ask you to contact the manufacturer or supplier in the first instance for replacement or repair under the warranty terms. If the manufacturer is unable to comply, we will replace the item or issue a refund of your purchase price for that item as per our Terms and conditions.
. The original postage, handling and shipping fee is not refundable. including any accessories, manuals, documentation and registration that shipped with the Product.